Ferrari’s (NYSE:RACE) Sebastian Vettel put the memories of his bumpy weekend in Bahrain behind him to head FP1 in China ahead of the MercedesAMG of Lewis Hamilton, as the 1000th F1 World Championship event got underway in Shanghai Friday. Mr. Vettel ended the session with a 0.207sec advantage over Mr. Hamilton, his chief rival from Bahrain 2 weeks ago. 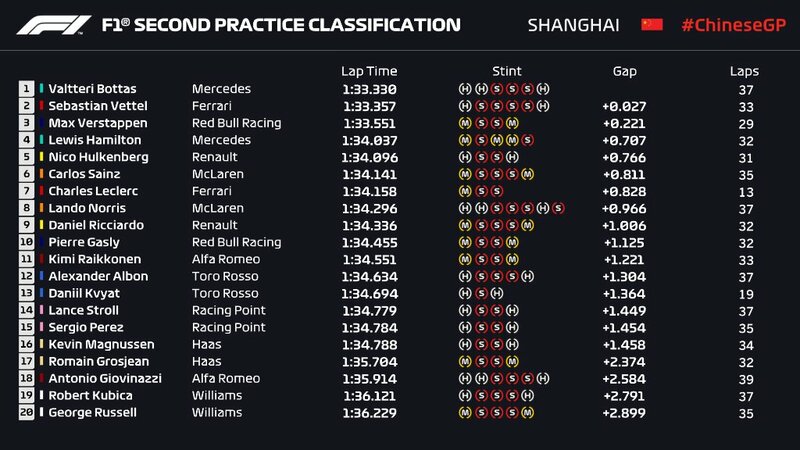 But while the gap between the 2 was not wide, Mr. Vettel set his session-leading time on the slower medium tires, while Mr. Hamilton was on the softs, a clear indicator of the Ferrari’s power advantage this weekend. Behind the leading pair came the second Ferrari of Charles Leclerc, with around 0.2secs separating him from 4th-placed Max Verstappen in the leading Red Bull racer, who was followed by the MercedesAMG of Valtteri Bottas. Ferrari’s (NYSE:RACE) Sebastian Vettel is hoping the Chinese Grand Prix will be a turning point for this season. Mr. Vettel believes that Ferrari can benefit from “that bit of luck” that eluded The Scuderia early in the season they will run hard and fast to mark the 1000th F1 race with a victory. The Scuderia set the pace in pre-season testing in Barcelona, but MercedesAMG has started this season with B-B 1-2 finishes. At Bahrain, Charles Leclerc was heading for his 1st F1 win, but engine trouble denied him the Top step late in the race..
Mr. Vettel finish 5th in Sakhir after spinning before running over his own front wing when battling it out with Lewis Hamilton to protect Mr. Leclerc, Mr. Vettel came 4th at the Australian Grand Prix. MercedesAMG have a 39-point lead over Ferrari and Mr. Vettel feels the iconic Italian team are due some good fortune at the Chinese Grand Prix this weekend. He said: “Looking after tires is one of the Key points in Shanghai, it is the most important job to do Sunday in order to be fast for the whole race. Mr. Hamilton leads team-mate Valtteri Bottas by a point after his win at Bahrain and the world champion will be eyeing a 6th success at the Shanghai International Circuit. The Y 2019 campaign may have only just begun, but there has already been talk of potential movement for the Y 2020 season. Max Verstappen’s future has been the subject of speculation, although Helmut Marko says Red Bull Racing are not worried about losing him to MercedesAMG. Mr. Marko said The Silver Arrow Team principal Toto Wolff calls Mr Verstappen and his father, Jos, frequently, but thinks Red Bull Racing can retain him beyond this season. Meanwhile, Daniel Ricciardo, who was the inner at Shanghai last year believes Renault are heading in the right direction after failing to finish his 1st 2 races with his new team. Again, Ferrari is the Aristocrat of the automotive sector.